Meal prepping is a must if you go to work, school or like to have healthy meals on hand at all times. Having healthy meals on hand will make your day and week run a lot smoother. This means you wont end up needing to purchase last-minute un-healthy fast food. You can prep the entire weeks meals on the weekend so you’ll always have tasty healthy food at reach. I assure you it’s well worth the extra effort and will also save you a lot of money. This sheet pan roasted chicken and rainbow veggies is a great dish to make if your just starting to meal prep or if you just want easy toss in the oven kind of dinner. Pre-heat oven to 450F. Line a baking sheet with aluminum foil and set aside. Place the chicken and veggies in the baking dish. Sprinkle all the spices and garlic evenly over the chicken and veggies. Drizzle with the olive oil. Bake for 15-20 minutes or until the veggies are charred and chicken is tender. Place 1/2 or 1 cup of cooked rice of choice into 4 individual meal prep containers. Divide chicken and veggies evenly on top of the rice. Cover and store in the fridge for up to 5 days or freezer up to 2 months. 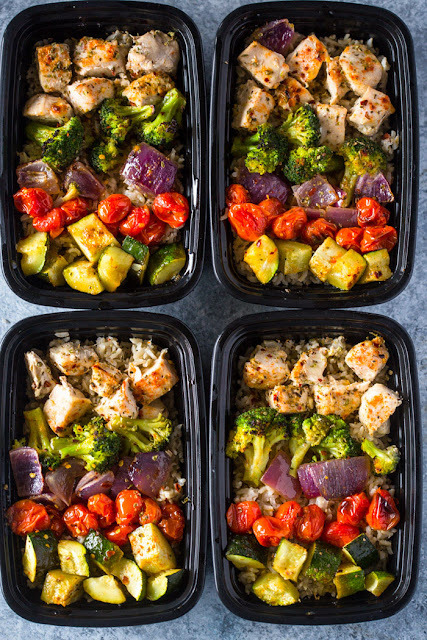 0 Response to "MEAL PREP – HEALTHY ROASTED CHICKEN AND VEGGIES"